The Garmin Striker Plus 9sv is the latest addition to the long line of Garmin fishfinder products. It is the largest unit in the Striker Plus series. The 9sv increases your ability to catch not merely fish. The sturdily built unit was designed to function in a variety of environments. The Garmin echoMap CHIRP 43cv is the latest in a long line of Garmin aquatic navigational aids intended to be ideal for small and even unpowered craft. Due to its small size and 5V power intake, it can easily be installed even on small fishing boats or canoes and kayaks, although in such unpowered craft an external source of power will still be required. Gone are the days when ice fishing meant one or two people sit huddled in a small shack, staring vacantly at a hole cut into a frozen pond, simply waiting for the fish to bite. With the Garmin Striker 5 Ice Fishing Bundle, you are now able to take the offensive in a traditionally passive past time. Generally, the most difficult part of ice fishing, aside from passing the time between bites on the line, is identifying where is the best place to fish. Garmin echoMAP CHIRP 73sv has a widescreen display resolution of 800 by 480 pixels from a 7-inch screen which gives it more than enough real estate for crystal-clear viewing. Perhaps the main selling point of the echoMAP CHIRP 73sv is its built-in CHIRP (Compressed High-Intensity Radiated Pulse) sonar capabilities. CHIRP does not just send one frequency at a time. Instead, it sends a continuous sweep of frequencies on a low-to-high range. This puts more pulse onto the target than traditional sonar, and consequently provides more detailed returns. The Garmin Striker 5cv is a compact, waterproof, and easy-to-use 5-inch fishfinder with CHIRP sonar. The rugged design withstands the harsh marine environment with excellent performance. The Striker is designed to allow you to mark your favorite fishing spots and navigate back easily, saving you time and money. At one and a half pounds, the Garmin Striker 7sv measures 9.3 by 5.5 inches with a 2.3 inch depth. It bears a 3.6 by 6 inch screen with a definition of 800 by 480 pixels that allows multiple sharp images to be displayed simultaneously. The display is also brilliantly backlit to make it legible even on the sunniest days and is flanked by a group of control buttons. Power from the device’s built-in rechargeable battery is sent through an included cable to a GT52 transducer where it generates an assortment of sonar pulses. No one wants to waste time casting their line into an empty stretch of water. The Garmin Striker 4dv is designed to be easy to use while eliminating the guesswork, so fishermen can focus on the true challenge of the sport. The Garmin Striker 4dv has a compact form that fits easily into any size of boat. The Garmin echoMap 53dv has a 5 inch high-contrast color display with keypad control and a MicroSD port. The LakeVu cartography and mapping solution provides you with instant access to over 17,000 lakes and rivers throughout North America. 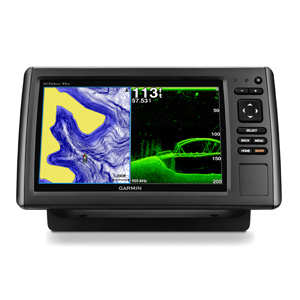 New for 2015 is the Garmin echoMAP 73sv fish finder/chartplotter. The unit comes with the power/data cable, a quick-release and flush mounts, a protective cover, the GT 40-TM, 12-pin transducer, all of the necessary hardware and an owner’s manual. The quick-release mount is exclusive to Garmin and enables anglers to permanently install the swivel mount and cable. Combining GPS with sonar and detailed mapping, Garmin has created a fishfinder unmatched by any rivals in its price range. With the Garmin echoMAP 93sv, the challenge of guessing where the fish are is virtually at an end, and the fisherman can focus on the real sport of getting the fish to take the bait. echoMAP 43dv is the new addition to the Garmin’s growing line-up of sonar products. Upon opening the box, anglers find the head unit, the power and data cable, the quick-release mount, GT20-TM/4-pin transducer, a trolling motor mount and all of the necessary mounting hardware in addition to the manual. The Garmin echoMAP 50dv has a 5-inch display, which provides VGA-quality imaging. Built into the echoMAP 50dv is Garmin’s trademarked High-Definition Identification target tracking technology. Better known as HD-ID, it provides a super clear image of the area under the boat. 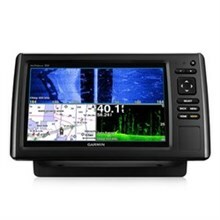 Garmin echoMap 70dv combines excellent sonar used on the echo series with the Garmin’s brand new DownVu technology, 10Hz GPS receiver, and a brilliant, touchscreen display. The echoMap 70dv has it all and is one of the finest fishfinders we have come across in a long time.